— the congas, a Cuban hand drum with African ancestry. Put that all together to a 4/4 “two-step” rhythm and you get…cumbia, cumbia and more cumbia! Today the genre has spread beyond Colombia popular all over Latin America, especially in Mexico. “Andean Cumbia” blends the indigenous music of Andean nations such Bolivia, Ecuador and Peru with the rhythmic beat. In Peru it has even developed into a distinct subgenre known as Chicha. PLEASE NOTE: The lesson and embedded video are NOT “How to dance the Cumbia” tutorials. 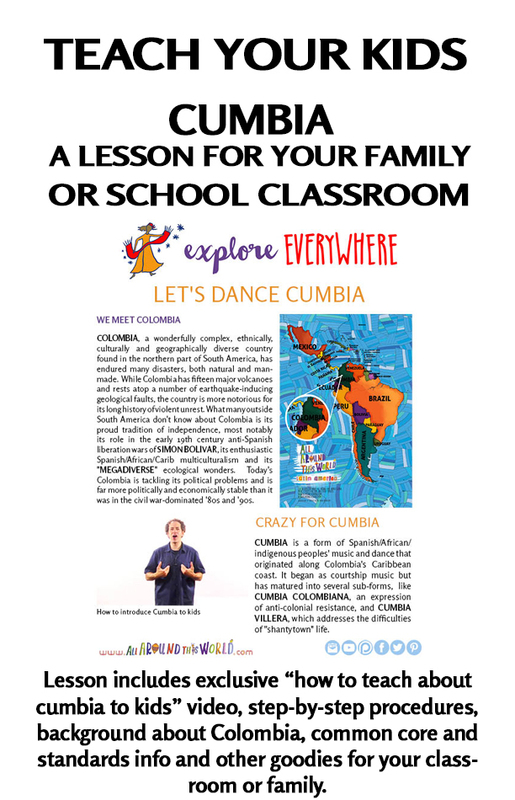 The goal of this lesson is to provide the tools for you to treat your very youngest students to their first introduction to cumbia and to inspire you to get up and dance together. (Your dance moves can’t be any worse than mine!) Ideally the lesson will be the first step on your and your students’ road to further cumbia exploration.